Ready to join the Miyagi-Do Karate School? Now you can with this karate Kit inspired by the classic movie! 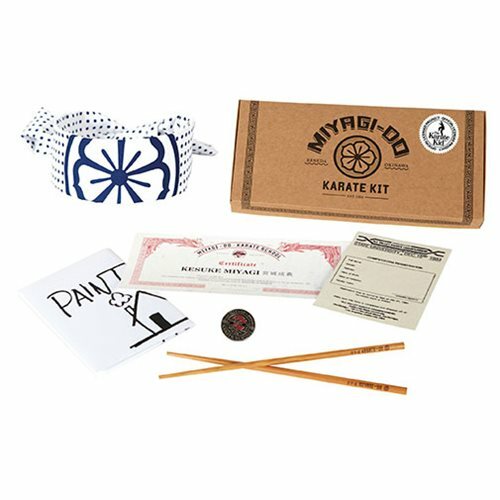 The Karate Kid Kraft Packaging uses a 1980's design and inside contains an exact replica of the headband used in the movies, custom chopsticks with the Miyagi-Do Karate logo printed on them, registration form for the 1984 All Valley Karate Championship Tournament, Miyagi-Do Karate School exclusive pin, handwritten "Paint the house" note by Mr. Miyagi, and a certificate from Miyagi-Do Karate School.